Savor the flavors of southwestern New Mexico with prickly-pear cactus pads and fruit. [Prickly pear] pads and fruits are enchanted edibles—a gourmet chef’s delight—and the nopal (pad) and tuna (pear) are both Southwest delicacies. “All prickly pears, both pads and fruits, are edible and nontoxic,” says Carolyn J. Niethammer, a wild-food expert, master cook, and author of The Prickly Pear Cookbook (Río Nuevo Publishers, 2004). In spring, the prickly green cacti burst into flowers. Splashes of neon fuchsia, blush pink, and incandescent yellow paint the land in a living watercolor. By fall, the egg-shaped fruits have formed. Near Socorro, the tunas are purple, dark maroon, crimson, and other shades of red. Prickly pears lend their glorious colors to natural coloring for foods, fabrics, and art…. On Cinco de Mayo, I buy a spineless nopal, slice it into green-bean-sized strips, then boil and fry the strips with potatoes, eggs, and beans. It’s delicious and nutritious—both nopales and tunas contain good amounts of vitamin C, and nopales are used in Mexico to aid diabetes…. To harvest the pads in spring—the leaves should be in their prime in May—choose young, unblemished, glossy-green leaves with a smooth, unwrinkled skin. Wearing heavy protective gloves and/or using tongs, cut the pad from the plant with care, leaving about an inch of leaf to allow new growth. Carefully scrape the spines off with a sharp knife. Rinse to remove the slippery substance that might ooze from the cut edge of the pad. Then, use a scrubbing pad to remove the glochids (tiny hairlike spines). Trim around the outer edge of the pad—the edge is thin, and hard to rub without breaking pieces off—then rinse again. Unless you have the snout and stomach of a javelina, hold the pad up to the light to make certain all spines have been completely removed—any spines left behind and eaten can cause severe pain to the mouth, esophagus, and stomach. To prepare the pads for meals, nopales can be diced, cut into shoestring strips, cubed, or left whole for grilling. (When cut into pieces, nopales are called nopalitos.) Cooked like a veggie, the flavor is akin to tart, lemony green beans. Some aficionados acquire a taste for the hint of raw nopalitos tossed into spring salads. Other cactus connoisseurs prefer to cook nopales to avoid the raw pads’ okra-like slipperiness. Nopales are delectable boiled, roasted, sautéed, or steamed. Once cooked, they can give several Southwestern dishes a palate-pleasing punch—they can be stuffed with cheese like a chile relleno; served with eggs in nopales con huevos; added to casseroles, rice, soups, salsas, and sauces; paired with chicken; or used as a terrific filling for tortillas. The tunas are in season in late summer and early fall. “We start harvesting prickly-pear tunas in mid September,” say Al and Jane Smoake, of A & J Family Farms, in Lemitar (70 miles south of Albuquerque and eight miles north of Socorro). To harvest the fruits, clasp the middle of the tuna with tongs. “A slight tug, twist, or bend of the wrist is required to loosen the tuna from its attachment,” they note. “If a tuna is difficult to detach, it’s not ready. Maroon juice flows from the tuna when ripe.” Tunas can be eaten fresh out of the hand, including the seeds, but not the skin. Deming-based writer Wendy Gist not only appreciates the beauty of prickly-pear cacti blooming in the desert, but looks forward to using the plant’s flavorful and nutrient-rich parts in tantalizing recipes in the spring and fall. This makes a delicious light entrée when served as a stuffing for warm flour tortillas. It can also be served with rice and a vegetable. Cut prickly-pear pad in 1½-inch squares. Film heavy frying pan with oil. Add pad pieces (nopalitos) and cook over low heat, turning occasionally, until pieces have given up much of their juice and are slightly brown. Remove from pan, cool, and chop into pieces as wide as a matchstick and about ¼ inch long. Transfer to medium bowl. Add remaining ingredients (except for chicken, tortillas, and lettuce), stir to combine, and set aside for flavors to mingle. Grill chicken breasts until done. Warm tortillas while you slice each chicken breast crosswise into eight pieces. 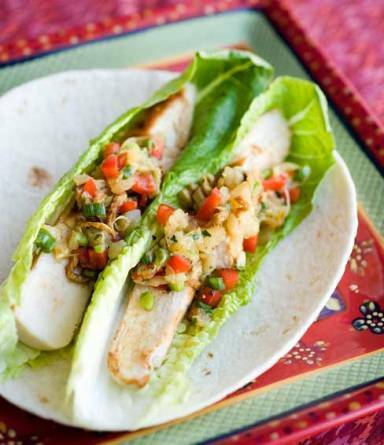 Divide chicken and lettuce evenly among tortillas and top with salsa. Fold tortillas to enclose stuffing. Steeping the lemons rather than squeezing them is not only easier, it produces a more complex flavor, as the final juice includes lemon oil from the rind. Scrub lemons and slice ¼-inch thick. Place in large heat-proof bowl or pitcher. Bring water to boil and pour over lemons. Stir in sugar. (Use less sugar if you’ll be adding prickly-pear syrup, more if you’ll use juice.) Let sit 4 hours. 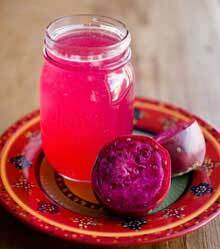 Strain off juice and add prickly-pear product. Taste and correct for sweetness. Refrigerate or serve immediately over ice.